The 16th edition of the Western District’s classic, handicap footrace will set off from the Old Joyce Farm and send runners down the fabled Sandy Lane. In addition to the 16km race, there are events for all ages and abilities – 16km ride, 8km run, 8km ride and 5km walk. Registration fee – $15 (15 years and under – $5) with proceeds supporting the Willaura Recreation Reserve and other local community groups. Late entries for all categories will be accepted on race day at the Willaura Recreation Reserve until 1 hour before each event. Late entrants may only participate as fun runners – times will not be captured & results not official. Each of the 2019 Willaura Farm to Pub events are point to point events, finishing at the Willaura Recreation Reserve. Participants must first arrive at the Willaura Recreation Reserve to collect their bib before catching the bus or making their own way to the start line for their chosen event. Walkers do not need to collect a bib. They may make their own way to the start line or catch the bus. 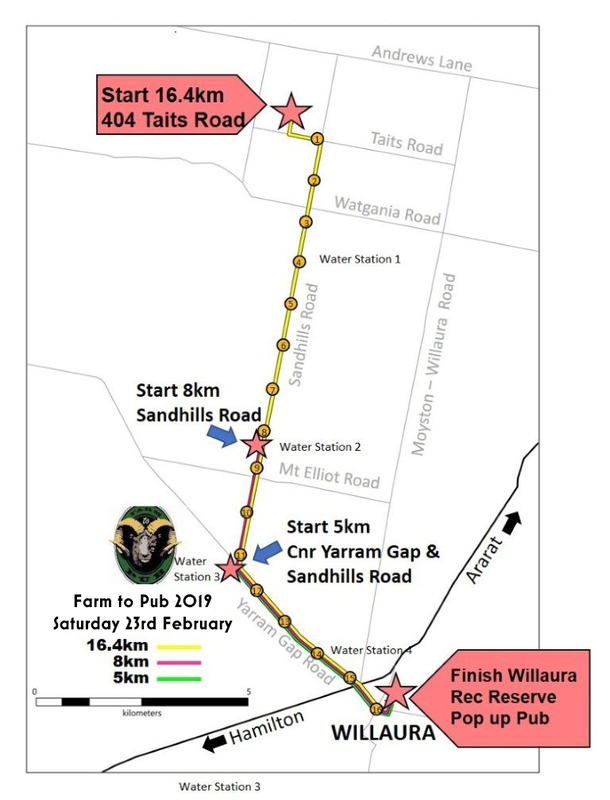 The Willaura Farm to Pub 16km run, 16km ride and 8km run are handicap events. During registration, you will be asked to submit your estimated finishing time, in minutes, to allow the calculation of your handicap. In a handicap event, the participants’ starts are staggered, with the slowest expected finisher receiving a head start and setting off first (known as the ‘limit’ runner or rider), followed in waves of increasingly faster participants until finally the quickest expected finisher departs in pursuit of the field (known as the ‘scratch’ runner or rider). Ideally all participants should finish about the same time – but the handicapper’s job is a challenging one. So you don’t need to be the fastest, and definitely not the best dressed, to be first to the Pub. A bus is available to transport participants to each start line from the Willaura Recreation Reserve. If required, simply choose this option when registering. Note that the bus cannot carry bikes. Riders will need to make own arrangements to deliver bikes to start line! The new home of the Willaura Farm to Pub, the Willaura Recreation Reserve, will have a “Pop Up Pub’, snacks and evening meals provided by Willaura Recreation Reserve Committee and a free jumping castle for the kids.